Regia Creativ - Make a Change, wear the scarf while you knit it into socks! If you like knitting socks, but want something new to try, Regia Creativ is for you! Regia Creativ starts out as a single strand that is knitted flat and then hand dyed. 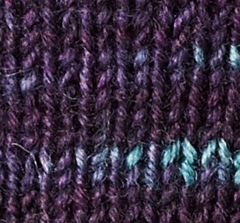 The result is a knitted scarf that you pull the ready to ravel end to knit yourself a pair of socks. The scarf is actually very nice and can be worn, so if you need a last minute gift for the non-knitter, buy them a cute scarf. We have one production run of Creativ, and our supplies are limited to stock on hand. Care: Machine wash, tumble try low heat.